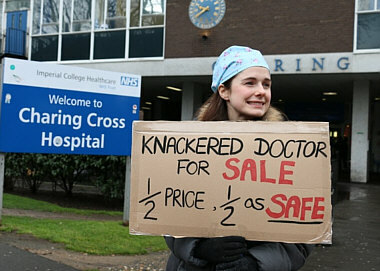 The Junior Doctors and the BMA have agreed a settlement of the dispute over the unsafe, unfair contract being imposed by Jeremy Hunt. The formula will go to a referendum of BMA junior doctors, but further industrial action is suspended until then. 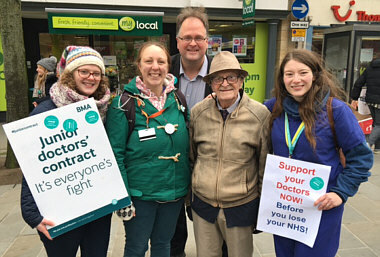 Health Campaigns Together supports junior doctors in their fight against the imposition of an unfair and unsafe new contract by Jeremy Hunt - a contract that would be a prelude to a major attack on the terms and conditions of all 1 million NHS staff covered by the Agenda for Change pay agreement. The BMA case is set out on their Junior Doctors page. Dr Yannis Gourtsoyannis gives an overview of the junior doctor dispute at NHA Presents: the junior doctors, damned lies and statistics. Clear, concise and very illuminating (from National health Action Party website).